There is nothing like a Sea Ray. Talk about a luxury boat! This baby can help you experience the high life in any type of water offering comfort, performance, technology and gorgeous technique. So what are you going to do if your Sea Ray isn’t seaworthy? Calling our Sea Ray Boat repair experts at Anchor Marine Repair should be the first thing that comes to mind! Our Minneapolis/St Paul boat repair shop is fully equipped to handle all types of Sea Ray boat services and Sea Ray boat renovations. If you own a Sea Ray, you are going to want to get to know your neighborhood Minnesota Sea Ray boat repair experts. Don’t see your problem on this list? That’s okay! Our Sea Ray repair experts are capable of addressing all types of repairs for your precious boat. Our large facility can accommodate even the largest of Sea Rays and our excellent relationship with parts and product suppliers can help give your boat the fastest turnaround time compared to any other Minneapolis/St Paul boat repair shop! Whether you are looking to upgrade the look of your Sea Ray or maybe your baby needs some tender love and care, Anchor Marine Repair can give it the renovations you are looking for. Turn heads every time you put that boat out on the water by letting us perform your Sea Ray boat renovations. 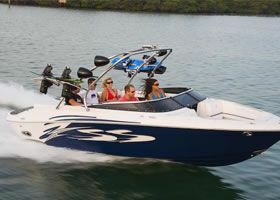 We can add luxury and the complex technology that gives you the experience out on the water that you deserve! So for all of your Sea Ray boat services, come visit your Minneapolis/St Paul boat repair shop! Anchor Marine Repair is happy to pick up and deliver your boat free of charge as long as it is within 250 miles of the Minneapolis and St. Paul area. So what are you waiting for? Call us today at 763-972-3540.